Skorpioner Her kan du snakke med andre om skorpioner. Scorpions use their venom for prey capture and defense. Several studies have shown that scorpions have different strategies for optimizing the venom use. The reason for this is of course because it take times to renew the venom and it is costly as the venom is a mixture of complex proteins. Edson Norberto Carcamo-Noriega and co-workers have studied the toxicity regeneration dynamics by the scorpion Centruroides limpidus (Karsch, 1879) (Buthidae) after full venom depletion by electrical stimulation. Interestingly, the regeneration happens in steps. 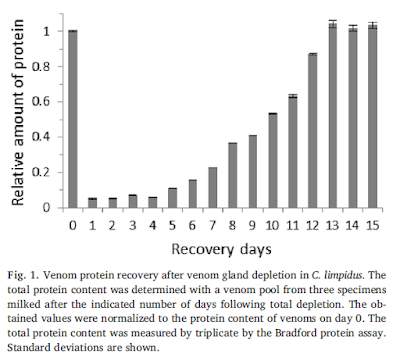 The normal venom volume is restored in 5 days, but the content will change in the days to come because the toxins need more time to be restored. It takes 10 days before the venom is effective against insects and it takes 13 days before the toxicity has normal levels and the venom is also effective against predators (mammals). The scorpion venom is a cocktail of many components. Its composition can exhibit a level of plasticity in response to different behavioral and environmental factors, leading to intraspecific variation. The toxicity and specificity of scorpion venoms appear to be taxon-dependent, due to a co-evolutionary interaction with prey and predators, which shaped the composition at the molecular level. The venom regeneration by the venom glands is an asynchronous process, in which particular components are expressed at different stages and at different rates. According to this, it can be reasonably assumed that the regeneration of toxicity in the venom is also asynchronous. In this work, we studied the toxicity regeneration dynamics by the scorpion Centruroides limpidus after full venom depletion by electrical stimulation. For this, we evaluated the toxicity of venom samples extracted at different days post depletion, against insects (crickets) and mammals (humans, by assessing the venom activity on the human voltage-dependent Na+ channel Nav1.6). The regeneration of toxicity against humans lagged behind that against crickets (13 vs 10 days, respectively). Thirteen days after depletion the venom seems to be replenished. Our results show asynchrony in the regeneration of species-specific toxic activity in the venom of Centruroides limpidus. 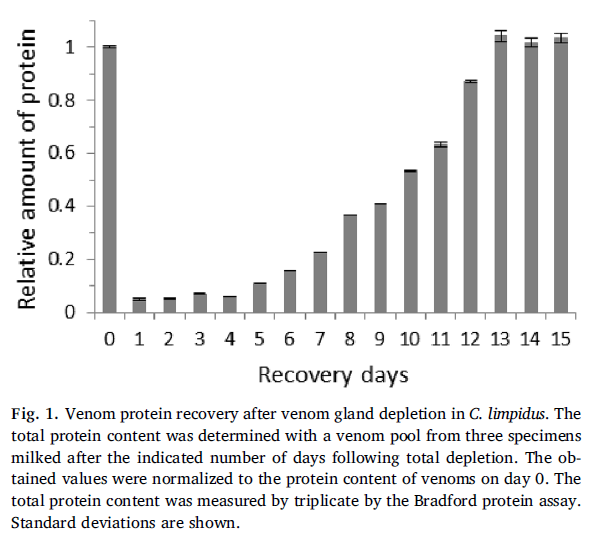 The understanding of the venom regeneration kinetics for the different scorpion species will help to design venom extraction protocols that could maximize the yield and quality of the collected venoms. Alle tider vises som GMT +1. Klokken er nå 10:41.